You just know it’s a good buy when one piece of furniture gives you the use of three! 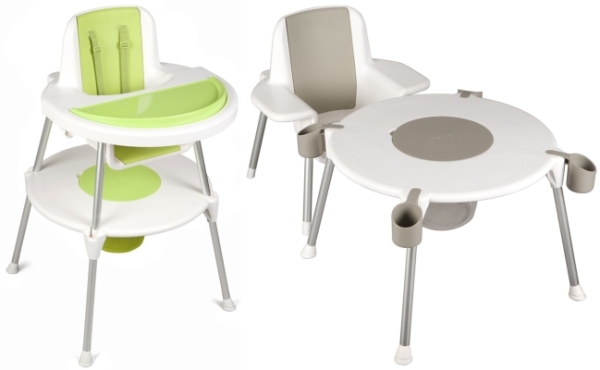 The Silver Cross Doodle high chair gives you all the feeding furniture you’ll ever need for babies and small children. 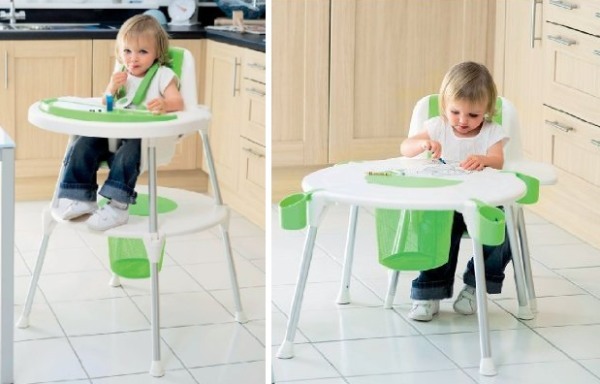 With a quick one-click re-jig, it transforms from a high chair into a table and low chair, eliminating the need for expensive separate pieces. It’s surprising how quickly a six-month-old starting first foods becomes a toddler with very different needs. My second son outgrew his high chair early so we went out and bought a table and chairs. It’s used every day and would have been better value had it been a high chair first! Made from sturdy easy-clean plastic, the Doodle comes with a dishwasher-safe tray for high chair mode and a mesh basket and crayon cups for doodling mode. Three colours of Apple, Aqua and Stone will be available from June 2010. Priced at just $289, the Silver Cross Doodle will save you dollars and storage space, and the word is that extra chairs will be available for when you expand your family. Update: Now available online at Bubs n Grubs. This highchair will be on our handy Chooser feature soon! If you’d like to compare highchairs, please check it out.